FBTBForums.net :: View topic - Darth Maul variation? Posted: Sat Jan 03, 2009 10:06 pm Post subject: Darth Maul variation? Hi Guys, I did a search and I couldn't find if this has been asked before. 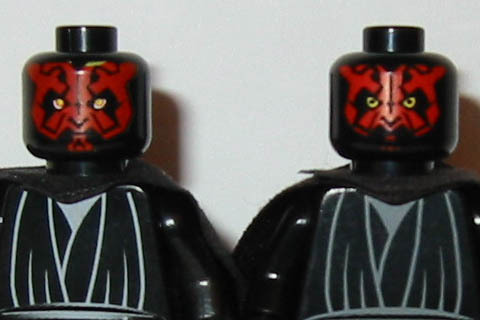 I noticed that I have 2 different Darth Maul heads. ( sorry no pic ),. one appeard to have more red on his chin. I dont think the other is worn down.Is there 2 variations? Bricklink does not show 2 ,only 1. Could one be one from the old Ep. I sets, and the other from the rerelased Sith Infiltrator from a year or two ago? I think your right. There is an EBAY auction 130279164755 thats shows the 2 I have which made me look at mine. Just was wondering why Bricklink which usually has all variations, does not have this one? It was brought up on the BrickLink forums a few months ago, but the BrickLink Catalog Admins didn't think there was sufficient evidence for it to warrant it's own catalog entry. I think it's pretty much the same as the older stormtrooper helmets, just an improvement on the printing process rather than a new print entirely. Looking at my Darth Mauls (and I hadn't spotted this before, thanks!) the newer one does have more red applied to its chin, and to me it looks darker? Question - which does the bricklink catalog entry show? I can't tell. It shows the one from the 1999 Sith Infiltrator. The overall pattern of the red looks similar enough that it could simply be printing variations, but the eyes are definitely different. Black in yellow instead of yellow in white. Thanks for the pic. The chin just seems like a minor printing variation, the more noticeable difference for me is the eyes. That should warrant a separate bricklink entry IMO. Are you sure that wasn't from the old Sith Infiltrator, not the new one? Both of the Darth Mauls in the pic have the same robes, but the new one from the remade Sith Infiltrator had a new robe piece, didn't it? Also, you'll notice that the overall red printing on the 7336 Darth Maul seems to be smaller, as the patterns appear to be closer together, and the top patterns are now touching the black exterior. I like the old one... Yellow sith eyes on! As I do not have the old Sith Infiltrator I am quite sure. The two Darth Maul figs in my collection are from Lightsaber Duel and the new Sith Infiltrator. Since, in that picture, the one on the left has yellow showing on top, I'm inclined to think (and probably so did the Bricklink admins) that the variation was just a misprint in the layering. Fortunately, it's not a bad mistake. Even still, it's common enough that a separate entry would be reasonable. Ah, so are there three different Darth Mauls? I forgot about the lightsabe battle - although I assume it would be the same as the old Infiltrator since they were released similar times. I noticed the change in eyes when I got the Infiltrator last year but didn't see any difference in the chin. It must be as Don pointed out: a printing error. I like the eyes on the newer one much more than the latter, and provided the new one has a fully printed chin mistakes excluded, that's, in my opinion, the better head. It's true! I've never noticed that! I have two different Darth Mauls and they are also from the Lightsaber Deul and the New Sith Infiltrator. Unfortunately they are packed away at the moment but I noticed the difference when I got the Sith Infiltrator and decided to keep Both. My recollection of the differences is as per Gingerbeard Man's photo but with better printing on the chin I think. Different eye and smaller print size overall.